Joboshare DVD Ripper Bundle for Mac is an all-in-one DVD ripper and video conversion solution which includes two powerful products, Joboshare DVD Ripper for Mac, and Joboshare Video Converter for Mac. It can rip DVD and convert various video formats to video and audio formats for playback on most popular players including iPod, iPhone, Apple TV, Zune, PSP, Pocket PC, Creative Zen, and Archos and so on. ...... WMV, DivX, RM, MOV, XviD, 3GP, FLV, SWF, MP3, WMA, WAV, M4A, AAC, AC3, etc. And Joboshare Video Converter for Mac is an easy-to-use, fast and stable video converter tools which designed to meet all your needs of convert between various video and audio file formats such as convert AVI to MPEG, WMV to AVI, WMV to MPEG or H.264/AVC video, convert AVI files to iPod formats, etc. Qweas is providing links to Joboshare DVD Ripper Bundle for Mac 2.5.2.0606 as a courtesy, and makes no representations regarding Joboshare DVD Ripper Bundle for Mac or any other applications or any information related thereto. 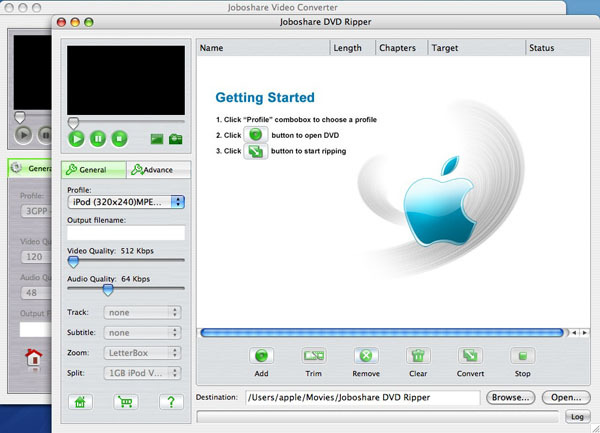 Any questions, complaints or claims regarding this application Joboshare DVD Ripper Bundle for Mac 2.5.2.0606 must be directed to the appropriate software vendor. You may click the publisher link of Joboshare DVD Ripper Bundle for Mac on the top of this page to get more details about the vendor.